From the dance of the simplest atom to the pulsing of the human heart, everything in the universe possesses the essence of rhythm. And since the beginning of the human experience, people from all over the world have gathered together to celebrate the primal practice of percussion and share an awareness of the cosmic beat. "A Circle of Drums... The Rhythms of Life" is a community-building, group rhythm-making event that can be an extremely powerful and wonderfully exhilarating body/mind/spirit experience for all who participate. Once considered a sacred art and effective means of communication by many diverse cultures throughout the world since antiquity, group drumming is once again becoming a popular force in bringing people together to share in the celebration of life. Promoting the spirit of teamwork, cooperation and sense of community. Rediscovering the wisdom and lore of an ancient musical ritual. Enhancing concentration, attentiveness, energy and awareness. Reducing stress, fatigue and negative emotions. Developing new life skills and personal interests. Having fun with music and friends! Special community gatherings, festivals and celebrations. Leadership conferences and training sessions. Youth camps and recreation programs. Educational and cultural enrichment organizations. People of all ages with disabilities. Nature and environmental learning centers. Senior citizens and residential care facilities. "A Circle of Drums... The Rhythms of Life" is a participatory presentation for people of all ages and abilities. Sessions will strive to provide an opportunity to develop individual confidence and learn about the dynamics of keeping together in time. 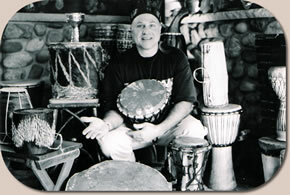 Previous musical or drumming experience is not necessary. Drums and rhythm instruments can be provided for groups of up to one hundred people with participants encouraged to bring personal instruments whenever practical. Several assistants may be necessary to facilitate groups of young children and people with disabilities. "A Circle of Drums... The Rhythms of Life" is intended to be as accessible and affordable as possible to all groups. Due to the varied and specific nature of all group drumming event requests, all fees will be quoted on an individual basis.